Age UK Salford is offering trips to Blackpool illuminations from Thursday September 29 to Friday November 4. The trip will include collection from one prearranged point, a drive to and through the illuminations. Stop off for pre-ordered take away fish and chips, a comfort break and return drive to your collection point. The cost of the sixteen seat minibus is £100.This equates to £6.25 pence per person and does not include the cost of the Fish and Chips. A pre-order for Fish and chips can be placed with Squires gate fish and chips using our minibus phone. This order will be collected prior to your return journey and can be eaten during your journey home. A comfort break can be taken during our stop off at Squires gate Fish and chips. Age UK Salford has over 40 years experience providing reliable and trusted services and are pleased to introduce their new Minibus. 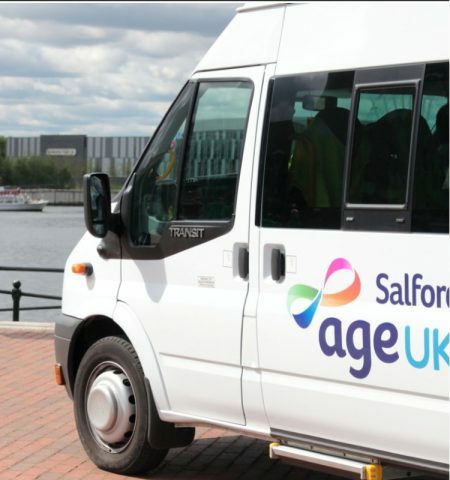 Age UK Salford want lots of older people in Salford to benefit from our minibus and we can now offer safe and secure transportation for all your trips and excursions. Our drivers have over twenty years experience in providing transportation services with a smile to older people. There are up to 16 seats available which can be adjusted according to the needs of the passengers, the number of mobility aids and any ‘wheel on’ wheelchairs to be transported. The minibus can take up to 3 fixed wheelchairs and can carry more passengers who use a wheelchair where they are able to safely transfer to a seat on the bus. All drivers are fully trained in the safe handling of wheelchairs and mobility aids and the wheelchair tie down procedure. Regretfully, motorised wheelchairs and scooters cannot be carried as they cannot be safely secured within the minibus and would exceed weight restrictions. Age UK Salford’s fully accessible minibus is used for their own excursions and is available for hire to other groups and organisations. Age UK Salford wants to help more local older people get out and about and have the opportunity to share experiences and feel connected to their community and the wider world. Hire charges go towards the costs of operating the bus and for the benefit of older people in Salford.